'SUNOH' (सुनो) is Hindi for Listen. It seems Lucky wanted everyone to listen to him. Sunoh was released in June 1996 with BMG CRESCENDO. 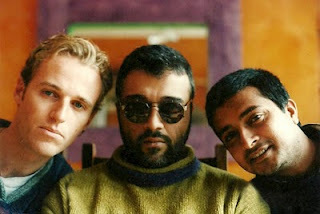 Sunoh was the first ever album to be released by Lucky Ali. It sold over Four million copies worldwide. This was way to beyond the expectations of Lucky himself. And you know what? The hit single 'O Sanam' from Sunoh stayed for over 60 weeks consecutively on Music charts of MTV Asia. Sunoh can be referred as history in the making as it was Sunoh which introduced Indian music fans to such a wonderful and talented singer. The song 'O Sanam' from Sunoh, considered by some to be one of the best indi-pop songs ever. Sunoh established him as an icon in the Indian music scene. The album was a phenomenal success. ﻿﻿﻿﻿Sunoh has Music by Lucky Ali, It was performed by Lucky Ali and Mike McCleary (did you knew that mike is his brother in law). The lyrics of the album were written by Syed Aslam Noor (a childhood friend of Lucky Ali with whom he used to clean and later sell carpets). You will be amazed to know that, Lucky Ali was rejected by a lot of music companies, for his first album. No one was ready to take risk and release the album. He didn't had enough money to make the album. So he decided to do it himself. He went to his friend Mahesh Mathai and told him to produce the video. He didn't even paid Mahesh for the video. He recorded all the songs himself with help from his brother in law Mike McLeary. After he completed the album, he returned to New Zealand, unaware of the success of the album. O Sanam, the first track from Sunoh was shot between the great pyramids of Egypt. The video was shot by Mahesh Mathai (Lucky's childhood friend). It’s an egyptian mystery, bright blue eyes behind a burkha and the promise of a man who would take Indian pop out of the rut it was in. (Incidentally, they were short on cast, so the woman you barely see is actually Lucky Ali’s wife Masooma.) Sunoh lived up to it s reputation with their minimalistic arrangements, relied on simple melodies and the purity of Lucky s voice. This is a story about a key In this album lucky ali has two birth in new birth lucky is a traveler and explorer and in old birth lucky was king of egypt. Lucky does love someone. Her (his beloved) father has done something illegal so lucky ali puts him behind the bar lucky ali’s beloved steals the key to the jail later lucky ali comes to know about it. According to his rules he has to kill her and he kills his love with his own hands and lost in his memory forever (mil kar bichhudna toh dastoor ho gaya, yaadon mein teri mazboor ho gaya). The album is a collection of 10 numbers all of which have a tale to tell. ‘O Sanam’ is a dedication to his beloved by Lucky. A very beautifully composed song has Arabian influences and an awesome array of instruments used . The video has been exhaustively shot in Egypt. The classy lyrics add to the passion. Just like Milke Bichadna Dastoor ho gaya, Yaadon mein teri mazboor ho gaya and aakhon mein basi ho par door ho kahin dil ke kareeb hai yeh mujhko hai yanki. This is superbly superb song that has made world record to stay 60 weeks on Mtv Asia chart bustard what naver had been happened untill it released. Pal do pal ki duniya saari ey musafir chalta ja. Chalte Chalte rah mein tu , pyar mohabbat baante ja. Aayega kal khushiyon wala. ‘Pyar ka musafir’ is an extremely hummable number. Mein hoon Pyar Ka Musafir, Dil Khush hai aaj Mera. Jahan Mile Mohabbat vahin mera Basera. Here Lucky depicts himself as a messenger of love in this world and sees himself dancing in fields spreading love to all. In this song lucky seems very positive about his life and sings mujhko toh yeh yanki hai manzil meri yanhi hai, jo dhoondhe mera dil aas paas yanki kahin hai. ‘Aap par arz hai’ is a mellow ballad by Lucky for his beloved, where he sings her praises and thanks her for being what she is. Lucky sings aap par arz hai laakho, karoro, arabo salaam Again, one does not know what steals the show - the amazing lyrics or Lucky’s magical voice. (Shaam savere na aao nazar, kudrat ki dhoondhoon mein aisi dagar, kisko sunaoon mein haale jigar, tadpa hoon main to saari umar). ‘Milegi milegi Manzil’ is the one of the best track on the album. Its Lucky Unplugged ! Just Lucky and his acoustic guitar.In search of dreams & being positive in life. The simplicity of the song & lyrics are simply breathtaking Chalte duniya waale saare raah magar anjaan kahin, main to hoon deewana meri deewangi mein naam sahi. ‘Tum Hi Se’ A thanks giving number to the God, Sun, Moon, Stars, Flowers, Water Falls etc. Donon jahan ka tu hai ujala raba tune hai humko paala. Lucky actually sounds grateful to the almighty and praise him. He is also inspired by nature and sings Raat chadni chhai hui hai chamak raha hai tara, thandi thandi yeh purvai socho kisne banaya. It’s lucky’s favourite song too. A constant continuous beat carries the song through till the end..
‘Yeh zameen hai, aasman hai’ is a love song. The song has a gujju garba kind of a tune. He views himself & his beloved cruising through the snow clad mountain valleys . A simple melody where Lucky again displays how good his vocal cords are. ‘Jab hum chhotey they’ sees Lucky remebering his childhood and how at that time he didn’t know what the future had in store for him. Lucky ali sings Raaste hai wahin hai toh pyaar ki kami ae rahi chal diya tu ab kahan. Lucky finds very big difference between present and past when he was child. A completely different song with regard to the mood & tempo. ‘Kya mausam hai’ is a continuous beat catchy number on the guitar which is one of the best in the album . Lucky takes you back to the land of masti and love. He sings Kya mausam hai phulo kaliyon mein gul hai, neele aasamaa ke o panchi le saath mujhe. Lucky asks all to be happy all the time cherish the good times and forget the bad times one has been through in life. That’s why he sings Himmat se zamane mein manzil apni dhoondhounga aandhi ho ya toofaan rukuga na mein sun le jahan. ‘Yeh Mumbai nagariya’ is no comparison to the others in the album. Lucky sings about his love for the city of Mumbai & I agree to each word of it being a Mumbaiya. It is the weakest link in the album. But still a good number. Author : Kapil Chandak | Email: kapilmail99@gmail.com |. Powered by Blogger.